Yeah, harmonica players, it’s no secret: we love the Digitech RPs! But the RPs don’t run on battery power, which is a drag when you’re in a situation where access to wall power is difficult or impossible. And every Digitech RP except the RP360XP has a fixed order for every effect in the chain, and all have a limit of one modulation effect per patch, meaning that there are some things that a Digitech RP Just. Won’t. Do. Enter the Zoom G3! The G3 has solid amp modeling and FX. 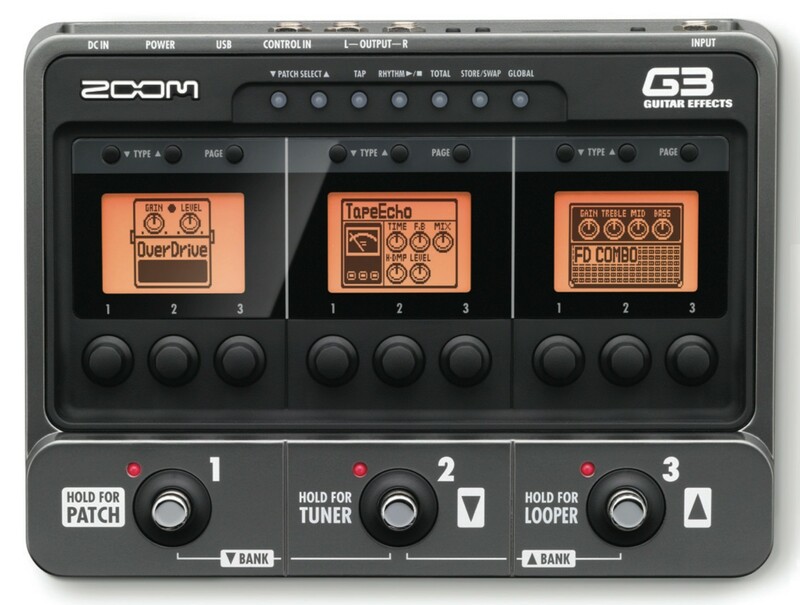 The G3 will run any set of effects you like, in any order you like, up to six in a row, so it can make some big, complex sounds that you just can’t make on a Digitech RP. And the G3 runs on batteries as well as wall power, so you can take it anywhere you can find an audience, whether or not there’s wall power when you get there. The Zoom G3: great sounds in a small package, and battery-powered too! Our patch set for the Zoom G3/G3X (now on its new, improved second version), includes 35 original patches designed for harmonica players in 3 main categories: amped blues and rock, clean, and electronic. We used all the principles of sound design we learned programming sounds for Digitech devices when we constructed this set. We made sure to provide some big, striking sounds that take full advantage of the Zoom’s ability to chain modulation FX–for example, a patch that includes both a low octave double and an autowah, a perfect combination that can’t be done on a Digitech, or an organ sound that uses multiple pitch shifters plus vibrato. The range of sounds in this set will cover almost any gig, and blow plenty of people’s minds, and each sound has been crafted for maximum volume before feedback. PLEASE NOTE that our patch set does NOT run on the Zoom G3N, which uses a different patch architecture and a different program for loading patches than the G3. We do not currently offer patches for the Zoom G3N, although we may do so in future. We have 10 years of experience with the Digitech RPs, and that much time to develop sounds that are uniquely tailored to certain kinds of material, including the various musics I play onstage, so the RPs set a high bar for any competition. After about a year working with the Zoom G3, and especially with the release of our version 2 patchset for this device in January 2016, we think that the Zoom produces basic amped tones that are fully comparable to the RPs, and it makes some really big effected sounds that are simply not possible on an RP. Don’t take our word for it, check out our G3 patch samples. The G3 has some very cool amp models for harp, and it sounds very good playing everything from amped-up blues to clean delays and reverbs to heavily electronic timbres. The usual suspects for harp-friendly amp models are here, including a range of Fender amp emulations. Some of the heavy-metal guitar amp models, like the Bogner, turn out to be very effective in delivering big low end punch for harmonica, with and without FX. The G3 has some great modulation FX; I immediately think of the phase shifter, which is the kind that sounds like a quacking autofilter, way cool. The G3 is also nicely performance-worthy, with 3 solid footswitches and an easy switch from stomp mode (where every switch turns an effect on or off) to performance mode (where the footswitches move you up and down through the patchset), easily equal in this regard to the Digitech RP360. In fact, it’s better than the RP360, because in stomp mode you can clearly see on-screen which FX modules will be turned on and off with a particular footswitch push. The Zoom also gives you three physical knobs per each of three onscreen FX to manipulate your sounds in real time, which is plenty for anybody with only two hands. If you want solid blues and rock sounds, great clean sounds, and sounds that go beyond anything you’ve heard from a harp before, plus some great performance features, and you want it all in a battery-powered device that runs on wall power when available, then the Zoom G3 is your baby. If you never need to run on battery power, then I’d choose the Digitech if you plan to go for a more traditional sound palette, the Zoom if you want to explore more extreme sonic territory. Like we said: you can hear us in action with a G3 running our patch set. We like it. Listen to all the sounds in the set here. At this point, we ask that you read some legal stuff related to the patchset. You will need to agree to these terms before your online purchase can be completed. Okay, now go to the bottom of the page and place your order. Q: What else do I need besides the patch set? A Zoom G3 or G3X. You can buy this used if you like with low risk. We check guitarcenter.com every once in while to see what prices they’re charging for devices we support in used condition. We see that G3s and G3Xs in excellent condition are selling for about a $50 discount over new (i.e. $109 for a G3, $150 for a G3X). That’s a low-risk discount purchase. a microphone. You can use any mic you like with the G3; anything that works with a “real” amp will work with the G3, and the sounds you get through the G3 with a given mic are going to be similar to the sounds you get with the same mic and a “real” amp. (Amp modelers are real too.) That said, the mic you want is the one that will work in the style(s) you want to play. Check out this page for audio samples of an amped-up Digitech RP patch with three different mics–that’ll give you a good idea of how the mic affects the sound of an amp modeler. We repeat: lots of mics will give you good sounds with the G3, and different mics sound different, just as they would with any amp. an inline lo-z to hi-z transformer if your microphone is a lo-z mic. If you use an inline transformer to connect your mic to an amp, or if your mic connects to the PA using an XLR cable, you will need an inline transformer to connect it the Zoom. Every once in a while we get an email from one of our licensees that says “I plugged the mic into the Zoom, and I can barely hear it.” That’s a pretty good sign that you need a transformer between the mic and the Zoom. an amplifier of some sort to amplify the output from the G3. In general, you’ll get the best results with a clean amp like a PA system or keyboard amp. We also recommend an amp with at least a 10″ speaker in order to reproduce the bass frequencies the G3 puts out. 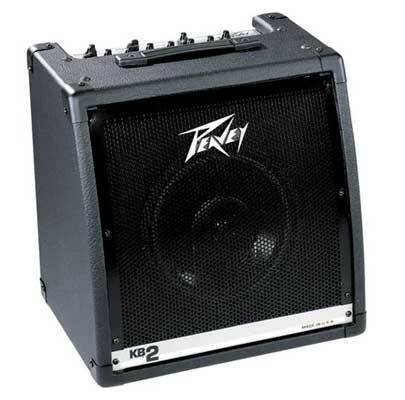 Our current favorite amp for pairing with a G3 is the Peavey KB2, which has a nice set of features (like a built in 3 channel mixer), enough power to play a lot of gigs (and a line out for those gigs where you need to bring the PA into the picture), weighs around 35 pounds, and costs around $250 new. You can read our review of it here. If you can’t find a KB2 or other keyboard amp you like, there are plenty of other options. We’ve played through powered PA speakers from Mackie, Peavey, and others that sound great. Peavey offers a powered PA speaker with a 12″ woofer, 100 watts of power, and three inputs with individual volume controls for about $340. Mackie offers a very nice speaker with similar specs for about $300. 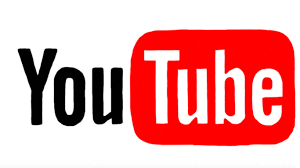 Again, look for something with at least a 10″ speaker and 100 watts of power. A powered PA speaker (or two for a stereo setup) and a G3 is a powerful, versatile, and lightweight setup for most gigs. PLEASE NOTE: in order to use our patch sets, you will need to extract the patches from a ZIP file, and download and install the Edit&Share application and the drivers for your G3 from http://zoom.co.jp. If you’ve ever installed any kind of software on your computer before, then you probably know how to do this. If not, then you need to get someone to help you. Anyone who’s moderately skilled in using their computer should be able to guide you through the process, which takes less than 10 minutes if you know what you’re doing. WE DO NOT PROVIDE BASIC COMPUTER SUPPORT. You do NOT need an external preamp for input to the G3. The G3 will work fine with a mic at the input. You do NOT need a direct box (DI) to connect the G3 to your amp or PA unless the cable run from the G3 is longer than 50 feet (20 meters). Q: What styles of music will this patch set work for? A: You name it. We supply patches in this set for just about every purpose. For most gigs, all you’ll need to do is bring the G3, your mic, and a couple of cables, and plug straight into the PA. It’s great for musicians who travel on planes–you can throw your entire rig into a shoulder bag and know EXACTLY what you’re going to sound like when you get to the gig. Q: What do I do if I need help? A: Contact us via email, if you need help with our patchset, and we’ll give you whatever help we can. HEY! If you’re ready to order, this is where you do it!